The Music Library is located on the first floor of Wilson Library on South Road, across from Stadium Drive, on the main campus of UNC-Chapel Hill. 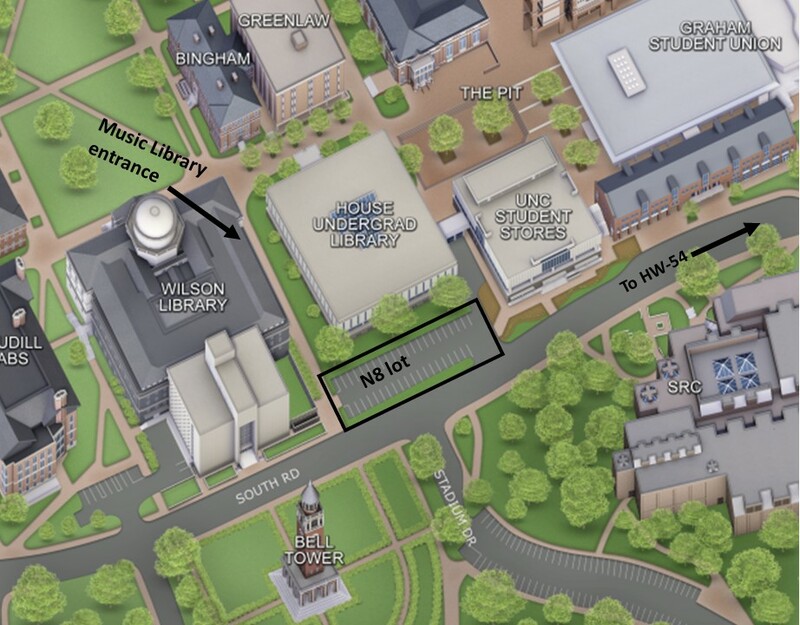 To get to the Music Library, enter Wilson from the first floor entrance on the east side of the building between Wilson Library and the Undergraduate Library. Parking is available in the Undergraduate Library N8 permit lot on South Road, across from Stadium Drive. This lot is only for general use after 5 p.m. on weekdays, but there are seven short-term metered spaces available between 7am and 9pm (30-minutes maximum). Payment for these spaces is via the pay station beside the spaces. UNC’s Parking website contains further information about visitor parking.